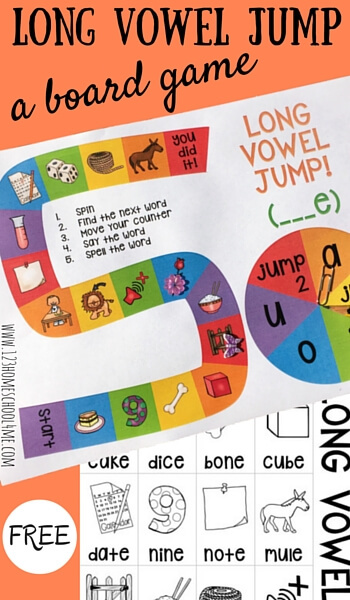 This long vowel jump board game helps children focus on the _ _ _ e spelling pattern. 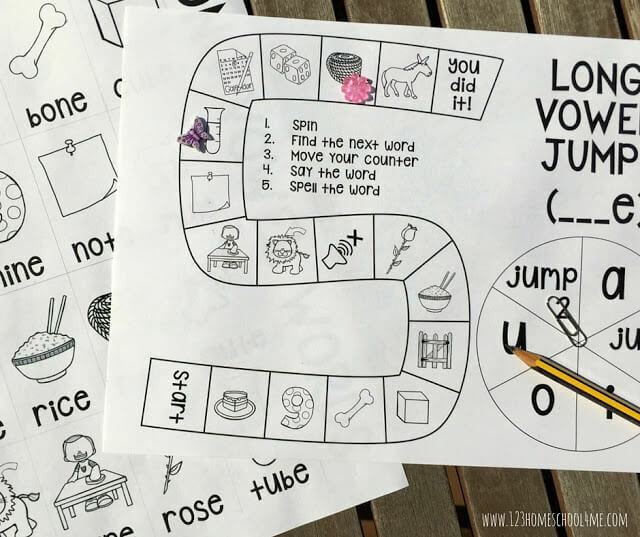 It’s great for Kindergarten and First grade students, and can be used for preschool as well if it’s used as a vocabulary building game. Print off the color or black and white game board, grab a paper clip, pencil and counters and get ready to play. Print off the reference sheet if your child will find it helpful. Laminate them so they’ll last longer! If your child is not familiar, or not very confident, with long vowel words that end in e, spend some time with them on this first. Use the reference sheet, asking them to say the names of each picture out loud, specifically thinking about the vowel sound they hear in the middle. Put your finger over the final e in each word and then say the new word (whether it’s real or silly). Stretch out the vowel sound in that new 3-letter word to hear how the vowel sounds, and how the short vowel sound (as in ‘cat’) is different from the long vowel sound (as in ‘cake’). Next, look at the way these words are spelled. They all follow the same pattern to make it easier for young ones to feel confident and to take a guess. Consonant – Vowel – Consonant – e. For eg, rice, bone or mute. Spin a pencil and paper clip on the spinner. If you land on a ‘u,’ for example, jump to the next picture that has a long ‘u’ sound, then spell it out loud. All these words follow the same spelling pattern. 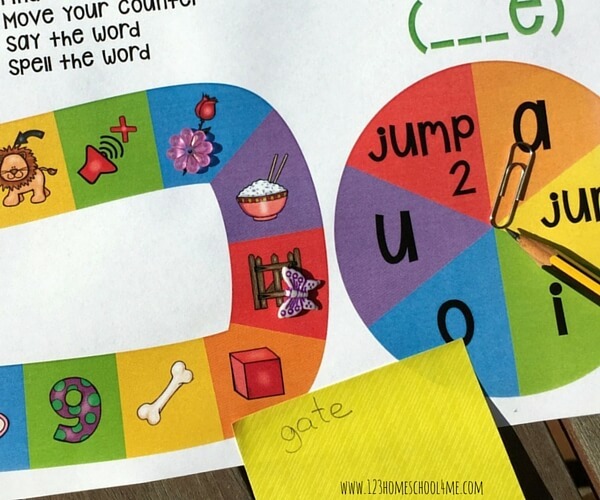 Children can use the reference word sheet if they need support. They can jump to ‘you did it’ when the vowel they spin is no longer represented in a picture ahead. For writing practice, write down the word they land on each time.